So I asked for the chance to review Always Red before I read Chasing Red. No problem there just gave me a good reason to expand my bookshelf. These two books (Chasing Red and Always Red) are a continuation of each other, so it's best to read them in order. 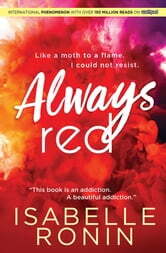 Although I've learned that you can still enjoy Always Red if you read it as a stand alone. I enjoyed Isabelle Ronin's writings her characters depth and speak to you. The plot is well written and believable that in some time this could happen to a couple of college kids. I loved watching the romance unfold between Caleb and Veronica. Beatrice was the perfect twist to it all.